Entasis can be defined as a slight convex curve in the shaft of a column or pillar. Entasis was introduced as a corrective system to counter the visual illusion of concavity produced by a straight shaft. In architectural terms, entasis can be considered to be the application of a convex curve to a surface for what can be described as essentially aesthetic purposes. 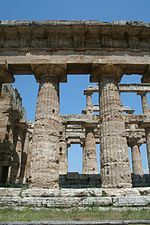 Entasis was often applied to columns during classical antiquity, particularly the Doric order and occasionally the Ionic order. The columns used to articulate temple facades would curve slightly as their diameter is decreased from the bottom of the column upwards. Some columns, as evident in the picture, would be at their widest at a point above the base of the column, however this method appears aesthetically displeasing for the viewer. Entasis was an architectural system devised to combat the optical illusion created by viewing a column from a distance at a viewpoint which is often lower than the foot of the column.